That's the South African equivalent of "how you doin?". While I don't use the local lingo yet, I am starting to understand it. "Lekker" means good and when you tell someone something they can't believe, they do not say "shut up!" or "really? ", they say "is it?". The only thing I love more than that is that when you thank someone, instead of saying "you're welcome" people say "pleasure". I doubt that it always is a pleasure for them bringing you a coffee or selling you a postcard, but it sounds nice. Cape Town reminds me a bit of San Francisco. There is a very touristy waterfront, there is an island off the coast that used to be a prison and there are a ton of funky boutique stores and restaurants for your eating and shopping pleasure. South Africa, of course has Nelson Mandela and the US has, well... enough of this comparison stuff. In the last few days, now out of my funk and rockin' Cape Town like the Superstar I am, I decided to let events for the day with the film crew unfold and have been playing tourist instead of freaking out (at least not full time). I took a tram (which they call a cable car and technically, it is a car of sorts traveling on an overhead cable but I can't think of it as a cable car so call it a tram), yes a tram to the top of Table Mountain and took in the stunning views of Cape Town, Camps Bay and the surrounding mountains. Some people abseil down the mountain (basically repel down it on ropes), some people hike down, I took the tram. Did I mention it spins 360 degrees while moving along the cable? 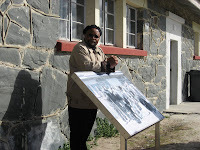 Yesterday I went to Robben Island, a former prison and now a World Heritage site. Full of political prisoners, the most famous being Nelson Mandela, it was opened as a prison in 1963 - the same year Alcatraz closed. The tours are led by former inmates, which is very interesting as they speak from experience. Our guy talked about training in Angola to fight the apartheid system and being caught and arrested. He said he's not bitter about being in prison as all the former inmates realize that reconciliation is the only way to move the country forward. All that and a penguin colony too! What else, what else... a township tour, a visit to the local aquarium to see the South African marine life and some giant spider crabs from Japan, which were very scary/impressive looking, and divers feeding the sharks. In Cape Town, I feel more like a tourist, seeing sights in an environment that is not that different from the environment I live in. It's less like the rest of Africa where I felt like I was on a giant adventure and everything was so new/different/fabulous/frustrating. But I did jump off the beaten path. Went to a place called "The Farm" which is associated with Longstreet Backpackers where I'm staying. Here, a man named Andre raises farm animals and takes in orphaned children. I spent a full day there talking with Andre and the kids while a pig sniffed my ankle and a goose bit my leg (revenge for killing his cousin in Madagascar? perhaps). I gave one of the girls, Asavella, my camera and she ran around taking photos... including this self portrait. I then stayed for dinner and met and interesting group of South Africans who had come over, including a filmmaker from Durban I will try to meet up with as I make my way to Jo'burg. You can read more about what Andre is doing at Hope for the Children. The film crew is coming tomorrow - I've made arrangements to visit a store that sells crafts made by local artists, much of it from recycled materials. I also have a list of 12 introspective essay questions to consider tonight. "12. From a strictly "life philosophy" perspective please tell us how the time you have spent in Africa has changed you as a person". Oh dear. Will definitely check in after the shoot tomorrow to let you all know how it goes. I'm thrilled that there will be an interview in a location in Africa and that there will be someone else to worry about the lighting and sound besides me. All that and there plans among the backpackers for karaoke on Thursday night and I already have a guy who wants to sing "I Got You Babe" with me. Cape Town won't know what hit them. The evil crab says "keep reading". You'll really feel like a Supa-Stah w/ the film crew following your every move. Can't wait to hear all about it.